I have some tasty new recipes (below) for you to enjoy. One of my favorites is the kimchi grilled cheese. 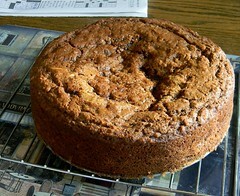 First, I have a secret recipe for a tried and true banana nut cake. This dish is only one of the award winning recipes featured in the “Blue Ribbon Recipes” cookbook. This book contains over 400 tried and true recipes for all of your favorite foods. Sift together flour, granulated sugar, baking powder, baking soda and salt; set aside. In large mixing bowl, add shortening, 1/3 cup buttermilk and bananas. Beat about 2 to 3 minutes until well mixed. Add the eggs and the other 1/3 cup of buttermilk and mix together. Add the sifted dry ingredients. Beat together until well mixed but don’t overmix. Add chopped nuts and mix. Pour into lightly greased and floured 8-inch round pans and bake in a 350 degree oven 45 to 50 minutes or until a toothpick inserted in the middle comes out clean. Frost with buttercream frosting (recipe below) or your favorite frosting. ICING: Add all ingredients to mixer and mix until thoroughly blended and fluffy.